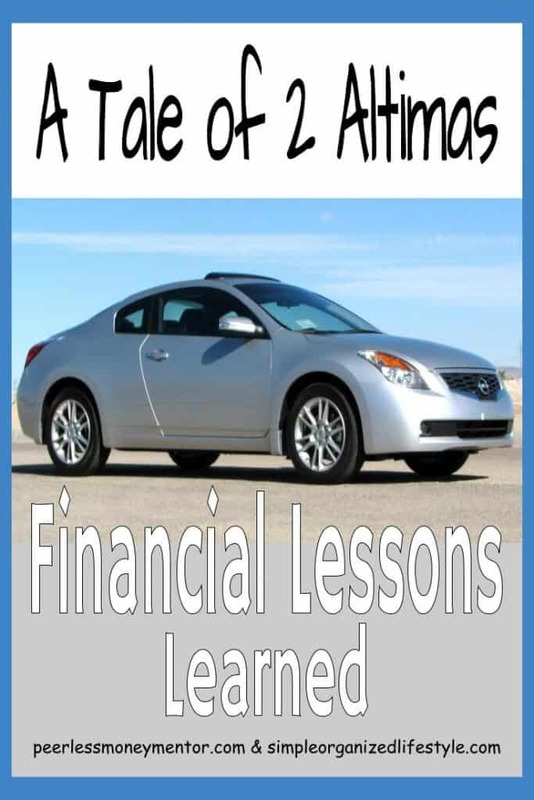 I am excited to be teaming up with another blogger to bring you a tale of two Nissan Altimas and the financial lessons learned. My teammate for this post is also my recent competitor in the Rockstar Rumble, a “March Madness” style competition to find the best money post of 2017. Before we get to our Altima stories, let me first congratulate Peerless Money Mentor! His article called Broke Phi Broke to Financially Woke pulled ahead of mine about the Millionaire Mindset and went on to win our bracket in the Rockstar Rumble Competition. I don’t like to lose! But Jerry was a class act all the way and here we are working together on an article, so I’m counting my loss as a WIN! My Nissan Altima story goes back to 2004. A colleague was pregnant with twins and she needed a bigger vehicle. She had bought the vehicle new and needed to sell it asap. A good deal to buy a “new” used car, right? Well, maybe if I hadn’t just bought a house. Maybe if I wasn’t still in the beginning years of my career. And single. And head over heels in debt. With a car that was working great. Do you ever want to go back and just shake your younger self? 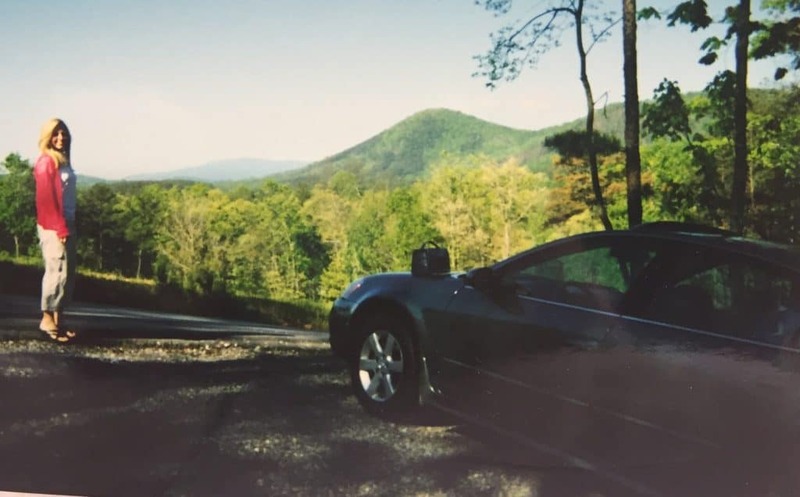 The Nissan Altima was also my first car that came “fully loaded” from the sunroof to the spoiler. It was a mint green color that I didn’t love, but I figured it would grow on me. I felt like getting this car was the professional thing to do. Sorry for the image quality, this was back in the day before everyone had a camera in their pocket! I financed the car for five years and added the car payment to the new mortgage payment. Student loans were accumulating as I decided to go to grad school. My beginning teacher salary was now stretched to pay everyone, except me. This is what we’re supposed to do right. Buy house and drive a new car. Check. Check. No sooner than I had signed the dotted line for that car, I met my future husband. In fact, less than a year later, I was sharing that mint green Nissan Altima with him. And guess what? I decided I would rather have an SUV and the mint green color never did really grow on me (or my husband). I learned that just because I could buy a car didn’t mean that I necessarily should have bought a car. It became more of an impulse buy just because I thought it was the next step in my career. IF… I had only lived at home just a little longer, or rented for awhile, I could have saved at least half of my teacher salary those first few years. Instead, what I bought was years worth of paying everyone except myself. 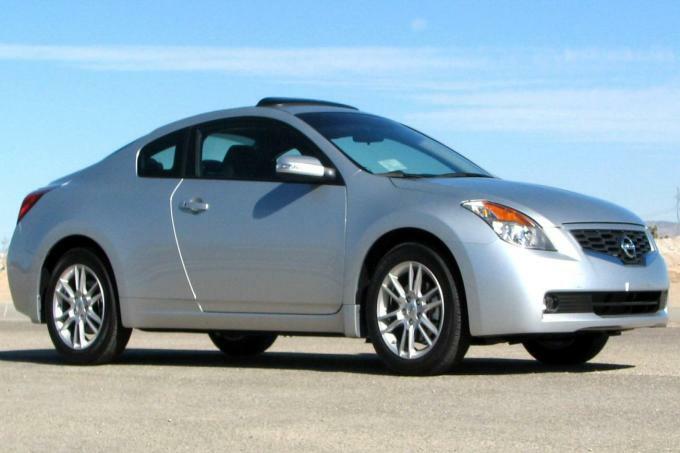 The Nissan Altima, although a very nice car, did not bring me joy. It’s hard to enjoy anything when you have to worry about how you’re going to pay for it. What brings me joy now is handing over cash for a planned out purchase. It’s much more meaningful to own versus loan! Learn from my mistake! Instead of using those first years of your career to accumulate debt, it’s the best time to get an early start on your path to wealth and financial freedom! The biggest mistake of my financial life was purchasing more car than I could afford! Misty and I competed in the first round of the 2018 Rockstar Rumble. Her post titled 10 Critical Habits to Develop a Millionaire Mindset and my post Broke Phi Broke duked it out in a March Madness styled tournament featuring the best personal finance articles of 2017. When our game ended, we decided to work on a post together! Misty came up with the brilliant idea to write about our Altimas. Below is our Tale of Two Altimas! In my article, From Broke Phi Broke to Financially Woke, I discuss purchasing a car I could not afford but I did not offer my readers much of a backstory. The reason why I purchased a brand new car was because the 1999 Nissan Altima my dad bought kept breaking down. It seemed like every other month, I was replacing something. One month I would have to replace the fuel pump. The next month I would have to replace the alternator. And the month after that I would have to replace the struts. So the logical thing for me to do would be to replace the whole dang car, right? Prior to starting my research, I had made up my mind that buying something used was my number one priority. I did not know about Financial Samurai’s 1/10th Rule for car buying at the time but I had read Dave Ramsey’s Total Money Makeover. In Dave’s book, he recommends that a person pays for a car with cash. Since I am hard headed, I immediately disregarded his advice and decided I would take out a loan for a used car. Why buy something cheap that would keep falling apart. No thanks, Dave Ramsey! Not following Dave’s advice was the first mistake I would regret. Having my credit score pulled with no intention to buy was the second. The first place I looked to purchase my used Nissan Altima was CarMax. After browsing their car listings online, I called them up to see if I qualified to purchase a used Nissan Altima that included a technology package. The finance department ran my credit and I was approved for a note of $290 but I was not ready to buy. I continued to shop around some more and everywhere I went the sales people were extra friendly. One dealership even got their general manager to speak with me. After learning that I had my credit pulled before, he warned me not to have my credit pulled again unless I was ready to buy. I would listen to him but make a major mistake soon afterwards. I met an aggressive saleswoman at Royal Nissan who would end up convincing me to buy a brand new 2012 Nissan Altima. Initially I resisted her attempts to get me to break my budget. However, it seemed like she had her masters in the art of persuasion. Plus, my job at the time kept promising me that a promotion was coming. I even started justifying the purchase to myself. “I deserve this car after double majoring in business admin and management” was my line of thought. But when you can truly afford something, there is no need to justify it! On Monday, May 21st, 2012 I entered the saleswoman’s office. I had made up my mind that this dark slate Nissan was mine, all mine! It did not take long to sign my financial freedom away. “Mr. Brown, sign here for your Gap coverage!” the finance manager said. Without asking any questions, I signed on the dotted line. This protection would cover me from paying the difference between the actual value of the car and the amount owned on the loan in an accident. I continued signing some more papers without perusing them. Although I had walked in the office a free man, I walked out a slave to consumerism. Today I am still paying for the biggest financial mistake I made years ago. I have 5 car payments left before I can scream with Dee-1, “I ain’t got No car Note. This debt has been weighing me down for almost six years. Please avoid making the same mistake I made. Delayed gratification is a powerful tool in the pursuit of financial independence and/or stability. Learn to use this tool and your future, wealthier self will thank you later! This is a great post! I’m glad to see the collaboration together. I think many of us have been in these shoes before. Mine was 2 poor decisions… a VW Golf and a Mitsubishi Outlander, both new, within 2 years of each other! Ugh, if I could go back and slap myself! However, just like you both, I’ve learned my lessons and I’m now happily driving about in my 15 year old Cadillac Escalade that I paid for in cash! Yes, I think a lot of us learned the new car lesson the hard way! It’s much more fun to drive a paid for car:] Thanks for commenting!